Ahmedabad In the morning arrive in Ahmedabad. Upon arrival, you will be transferred to the hotel in Ahmedabad. In the afternoon you will visit the Gandhi ashram, the Akshardham temple. Ahmedabad In the morning you will visit the Hathee Singh Jain Temple, Jama Masjid, Calico museum of textiles. Ahmedabad – Rajkot (about 225 kms) In the morning you will drive to Rajkot. In the evening arrive in Rajkot. Overnight stay at the hotel in Rajkot. Dwaraka (about 235 kms) In the morning after having breakfast drive to Dwaraka. In the evening arrive in Dwarka and drive to the hotel. Dwaraka – Porbandar (about 122 kms) In the morning you will visit the Dwarkadhish temple. After visiting the temple drive to Porbandar. Later in the evening you will visit the Kirti Mandir in Porbandar. 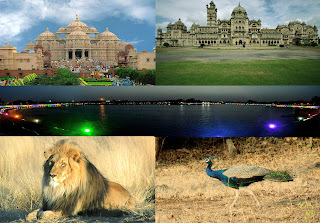 Porbandar – Somnath – Junagadh (about 217 kms) In the morning drive to Somnath to visit the Somnath temple. After visiting the Somnath temple drive to Junagadh. In the evening arrive in Junagadh. Junagadh – Ahmedabad (about 315 kms) In the morning you will visit the Mount Girnar. Mount Girnar is one of the hills which is most sacred to the Jain community. After visiting these temples drive to Ahmedabad. In the night transfer to the airport or railway station for the onwards journey.